UK – Even by the standards of a world premiere this was a big one. 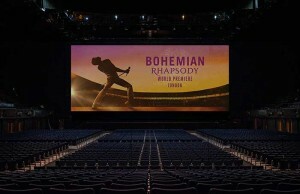 Presented by 20th Century Fox ‘Bohemian Rhapsody’, the eagerly awaited Queen bio-pic played to 7,000 people in the hallowed confines of the SSE Arena Wembley. And therein lays a dilemma. Queen fans will be well acquainted with the confines of Wembley, not least the booming reverberant nature of its acoustics. And that of course is exactly the sound the producers of the film needed to be recreated for the live concert scenes within the film. Paul Massey, re-recording mixer for the soundtrack, went to considerable lengths adding reverb and even hints of slap-back to the soundtrack to reproduce the authentic 1980s' Queen concert experience for cinemas goers. 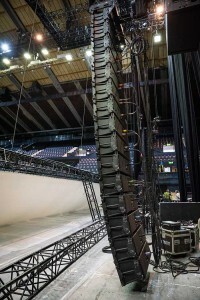 “But of course, when staging such a premiere in a room like Wembley using a huge 7:1 audio system from Britannia Row Productions (Brit Row), the last thing you want is added reverb’ and slap-back.” Fortunately, this comment from audio consultant Colin Pink carried some weight; not for nothing did technical producer Andy Peat, of Andy Peat Associates assemble such an experienced team for the premiere. “I was asked by James MacFarlane, senior technical manager at 20th Century Fox early in the summer to prepare for a premiere event sometime in the Autumn,” explained Peat. 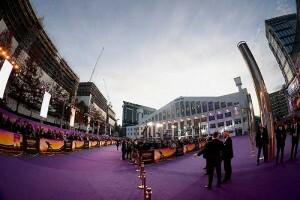 “My role was to look after all the interior technical infrastructure, working for and with Premier PR headed up by event director Hilary Chadwick who, as the overall event producers oversee everything else, from the exterior red-carpet arrivals to the VIP seating plan within. I’ve used Britannia Row for these kinds of events many times before and they were also the preferred provider for 20th Century Fox. “But this was a first in terms of using Wembley so new considerations arose. 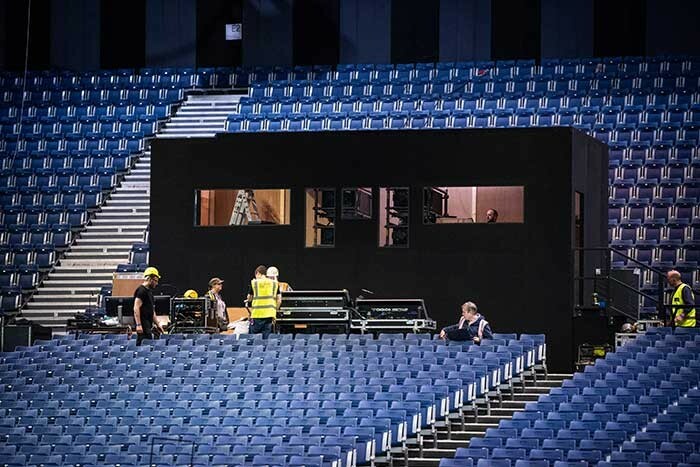 We worked with projection specialists Motion Picture Solutions to define how large a screen could be used, obviously for an arena scale show everyone wanted it to be as large as possible while still fulfilling the roll of being of the highest technical quality. “At 28m by 11.7m the 1.4 Perlux gain screen was enormous. 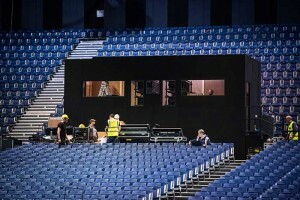 Made by Harkness at its French facility, the only factory large enough to produce such a sprayed screen, it was rigged by Blackout who also took care of the multiple PA points. It was slightly angled back from vertical by three degrees, so the light reflected back directly onto the audience. The angle makes a big difference to how bright the audience perceives the image to be. The projection booth was built and installed by Steel the Scene; lined with 120mm thick acoustic panels to isolate any sound from the booth to the outside; the projector module also sat on an isolation island so the projectors themselves were unaffected by the vibrations of operators moving within the booth.